Arangetram is a granduation performance, which showcases the great tradition of passing on the knowledge of Bharatnatyam dance, from the teacher to the student. Bharatnatyam is an artistic yoga that involves the movement of the body parts in a very artistic and elegant manner. Coming to the Arangetram level in classical Indian dance is more than preparing for a world-class athletic competition. It demands focus, physical endurance, drive, and determination. Understanding the religion, mythology and culture becomes essential. Arangetram is a major milestone for a dancer toward possibly becoming a world class dancer. The performer must have a lot of stamina and concentration as he or she has to perform the Arangetram for about 3 hours. 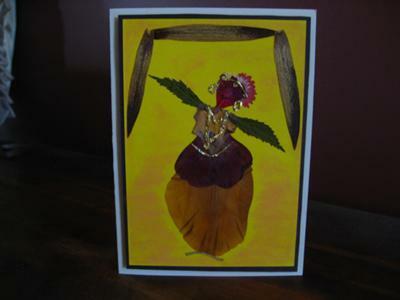 The card was made for my friend’s daughter who was graduating after undertaking 7 years of Bharatnatyam training. She was extremely happy to receive the card that was made specifically for her occasion. Her parents also appreciated my creativity and asked every little details about how I had made it. I had used the pressed flowers for the body/dress and candy wrappers for the jewelry. It had taken about an hour to put together. More time was spent in finding the right petals from my collection of the pressed flowers. Absolutely Beautiful Raksha and thank you so much for shaing, both the card and the story. It is facinating to learn about other arts around the world and this one is completely new to me. I wish your friends daughter all the very best in her future. Thank you for your kind words. I love using found materials in my cards. I will post more pictures of my cards and each one is made using the leftover card stock and recycled materials.